What It Is: With Spring freshly arrived (in theory) and Easter on the very near horizon, I was drawn to this pretty porcelain tube vase as a seasonally appropriate gift idea. 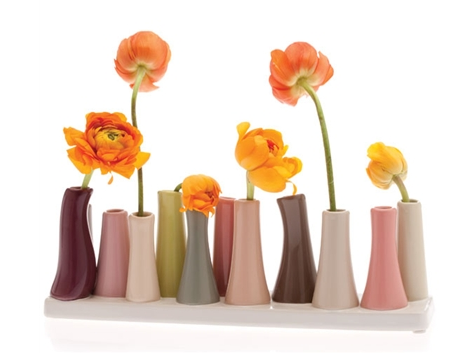 Called the ‘Pooley’ vase, it actually comes in a range of sizes and colours to match just about any decor. Cluster flowers for a riot of colour and texture, or spread them out for a modernist look. Picture it in your front entryway, back porch, or even on top of your dresser for a breath of almost literal fresh air. Who It’s For: Your mom, as a fetching Mother’s Day gift. Your sister, as a sweet wedding shower option. Your wife, as a beautiful anniversary present when filled with flowers. What It Costs: $44 for the model pictured above, although prices start at a quite reasonable $26. Shipping is $12 to Canada. Where It’s At: A lovely little site called Chive. Ezensa bonus entry time! Tell me who on your gift list would flip for this pretty vase? My daughter is so creative with ornaments and flowers – it would make a lovely gift for their new home. My sister-in-law would love one of these and so would I. We both go for the modernist look! I love this but if I had to give it away it would go to my daughter who is artistic & loves shapes & form & colour as much as I do. My mother — she loves taking care of plants, and this would make her day. For my mom – she would love it. Ezensa bonus entry: My cousin would flip for this pretty vase. She always has flowers in her home. These are really cool!! I would gift this to my sister! She loves flowers.